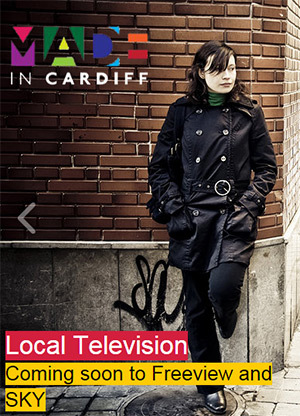 On Wednesday, TV Company Made unveils Made In Cardiff, the Capital’s very own local television service. It promises to fill gaps neglected by established local television and provide the people of the city with a ‘fresh and alternative viewing option’. It will, amongst other items, broadcast 30 minutes news programmes twice nightly, produce current affairs features and devote itself to Cardiffian entertainment and sport. Having been awarded the licence to broadcast by OFCOM in September 2012, the progress towards the opening night has been rather troubled, not least because of confusion over the funding of the company responsible for building and maintaining the infrastructure of the network required to broadcast. What is clear, though, is that Made In Cardiff itself will receive £150,000 from the BBC in its first year, with a lesser amount forthcoming in the two years after that. Just £10 for each ad? Wow. It has to be said that the omens for success are not particularly favourable. OFCOM recently revealed that it is ‘very unlikely’ that all local TV stations will survive’ and London Live, the biggest station to launch, is in serious difficulties having recorded close to zero audience figures for some its programmes. Birmingham City TV went into administration without ever reaching broadcast – it had failed, through insufficient funding, to even find studio space and equipment. But there are plenty of reasons to think that Made in Cardiff can be a success. As D – Day approaches it has 20 staff based in offices in the city centre, very talented journalists (Mariclare Carey-Jones has considerable experience with ITV Wales News) and lists partnership links with a variety of established names such as Cardiff University, Cardiff Blues and Glamorgan CCC. Cardiff is also, lest we forget, the 3rd biggest (behind Salford and London, of course) media centre in the UK. Its creative industries are thriving. The key to success, though, is ultimately financial and lies in attracting advertisers. And they only way that will happen is through producing and broadcasting programmes that people want to watch. I’ve just looked at the sample schedule from 2102. I wonder if ‘Pets in the City’ and ‘Misbehaving Mums to be’ are still on the menu? Made in Cardiff will appear on Freeview channel 23, Sky 134 and Virgin Media 159. ← Ydych chi’n deffro i newyddion Gymreig?